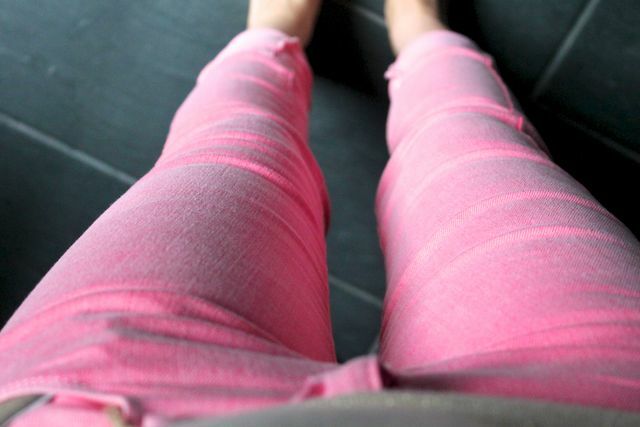 I have been longing for the right tone of pink jeans for about 2 months now. I got a lovely pair in Topshop but they are more dusky rose than in-yer-face pink. And I want in-yer-face. So today, whilst checking out the TRF part of Zara, which I generally always forget about, I found them! They are an exact dupe of the J Brand skinnies I longed after...but didn't want to pay near £200 for. The Zara version? A bargainous £25. Cropped, skinny and a happy shade of pink. 1) I bought the most amazing/ridiculous mid-length ballerina skirt in H&M (will have to photograph). 2) Boots now stock the Sally Hansen polishes which have previously been deprived from British shores. My top tip is Commander in Chic. I tried this last year and if this shade is representative of the line, prepare yourself for great brushes and a creamy, long-lasting finish. 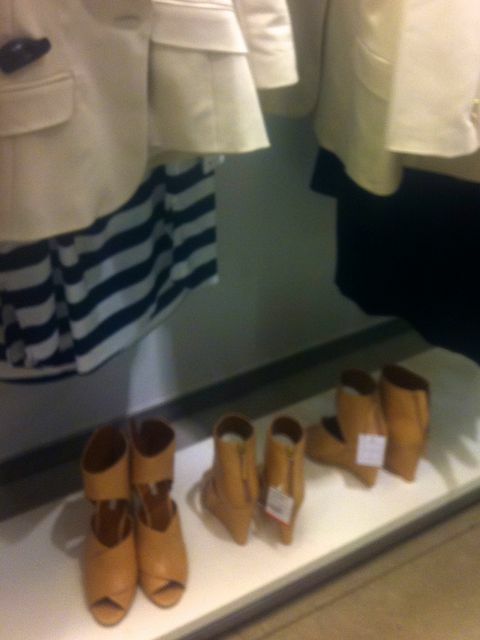 3) I saw some wedges in Zara...and now I keep thinking about them. They look ridiculous from certain angles and the colour reminds me of skin...but something about them appeals to me. Fingers crossed that nobody likes them and they wind up in the sale! 4) After a lovely, if boozy dinner at Cote last night I purchased Rimmel's Lasting Finish foundation - you know, the one that lasts for 25 hours (as if we want to wear it that long)....Used it today and whilst the smell isn't bad, I don't think the coverage is superb. Maybe it stains your skin for a long time with a bit of a tint but it feels like you need multiple pumps to do the job that a more pricey foundation achieves with a minimal amount. Chanel Mat Lumiere I am talking about you! @BealeCheeks - ah no really? Maybe my memory is wrong :) haha I really liked it at the time but it has been a while since I used it. I should buy with caution then! 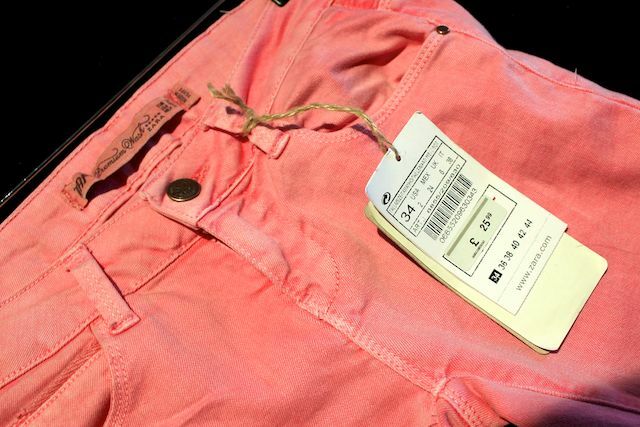 I love my pink straight legs (they fit like skinnies) and I got them from Uniqlo when they were going mad for bright jeans! I love wearing mine with my grey slouchy jumper! Do give the Rimmel another try! I must confess I haven't tried many high end foundations, but this 25 hour one is the best I've ever tried from the drugstore and it only cost me about $7 which is ridiculous. I fully expected it to melt my face off. Maybe that's why I was so pleased with it! Those look adorable on you! Love em! I saw the zara heels too, and they look lovely :) love the pink skinny you got look really nice on you !the rimmel one sometimes works for sometimes not and I just gave up. it's something that shouldnot put too much bc it looks bad.. really bad. but you're right it kinda stains on the skin and the color range is not good either. enough of me complain. I got a new foundation by clarins 2 weeks ago which I am absolutely in love it have spf 25 too, so all good :) have a great day Laura ! I have better luck with Rimmel's Pro line of nailpolish. I love the jeans, Topshop do a dusty pink full length pair and they are gorgeous. I also really like the wedges, but I wouldn't wear them together! That Rimmel foundation comes in rubbish shades, I'm NC15 and the lightest foundation was orange on me :( I wish I tanned easily! Amazing jeans! Don't know if I'd be brave enough to wear them but good on you! Great news about the Sally Hansen polishes, especially seen as though I have a Boots voucher for them! I like the Sally Hansen nail polishes too. I love pink jeans at the moment, those ones are lovely. I really like the Zara shoes too, they look like they could be quite uncomfortable though? What I love about your blog (and you Laura) is how on trend you are. You always seem to catch a trend at its birth, if not its conception. You are not only on trend, you create it. There's a lot to admire about you, i.e. your style, your natural beauty, AND how you present yourself to the world. I find it hard as a novice blogger to capture one's essence or true personality while maintaining a level professionalism on the open internet--where everyone and anyone may read. You do it splendidly. In other words, I feel like you blog openly and honestly and have the skill to edit yourself in a way that will not offend anyone. My point is, I love you and am so happy you're back and doing well! I was never a big fan of neon denim but you may have changed my mind! That pink looks great and it suits you so well :D I also love the Sally Hansen varnishes and they're dominating my modest nail polish collection! The jeans look lovely! I would die for a pair of ridiculously hot pink cropped skinnies but alas I can't find them anywhere! I love the jeans. Such a perfect color for spring/summer. i am in love with those pink jeans. i loved the j brand ones too, but didn't want to shell out that much money on a pair of pink jeans that i may or may not wear a lot. hopefully zara has these online in the u.s. because i don't have a store nearby. thanks for sharing. happy you're back at blogging. take care. Those jeans look amazing on you, I could never wear that colour! But I've been buying a lot of ankle jeans, love them! Lovely pair of jeans!!! I appreciate anything with a Marant feel lately and this definitely fits into that category!!! Laura, do give the Rimmel foundation another go. You only need a tiny bit cos it goes a really really long way. To get my perfect shade I bought two shades and I mix them together on the back of my hand before applying to my face (shades 202 and 404 combined). Still works out cheaper than buying x1 high end product. Love the Rimmel 25 hour foundation!